The Hart House Singers is a non-auditioned choir at the University of Toronto that provides an opportunity for first-time and experienced singers to share in the joy of choral singing, to learn the art of song, to have fun, and to sing culturally and historically diverse repertoire. The Hart House Singers is a non-auditioned choir at the University of Toronto that provides an opportunity for first-time and experienced singers to share in the joy of choral singing, to learn the art of song, and to sing historically and culturally diverse repertoire. 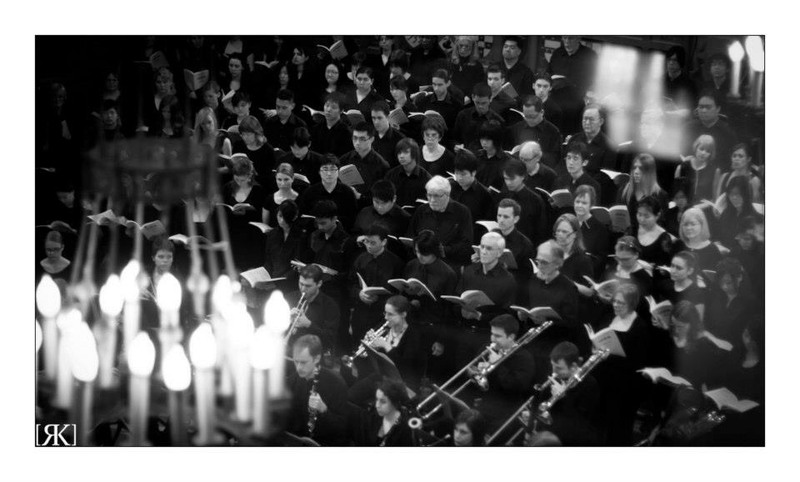 Typically, the choir performs music from around the world in its summer or fall terms, and one of the great choral works in the winter term. 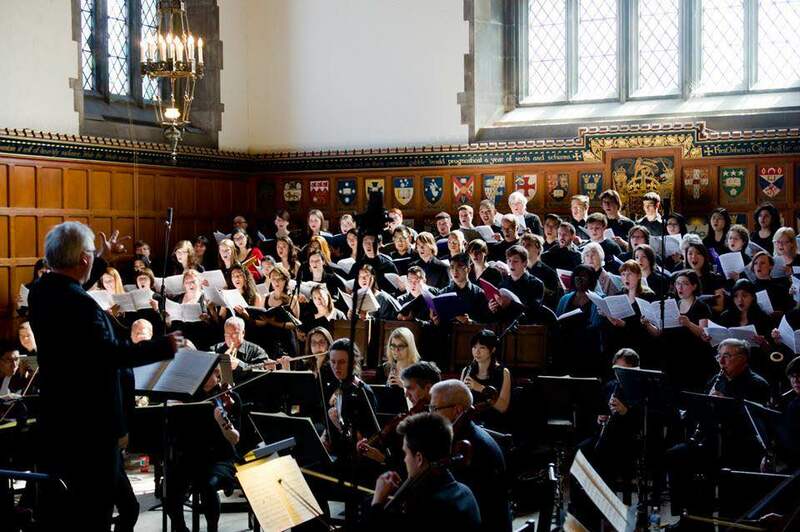 The Hart House Singers has performed at Toronto’s “Nuit blanche,” and in Mahler’s Symphony No. 2 and Holst’s The Planets with the Hart House Orchestra. In the past few seasons, we have performed such famous choral works as Bruckner’s Mass in e minor, Dvorak’s Mass in D and Stabat Mater, Mozart’s Requiem, Haydn’s Mass in Time of War, and Beethoven's Mass in C with orchestras made of students and recent graduates from the Faculty of Music and the Royal Conservatory of Music, and local professionals. 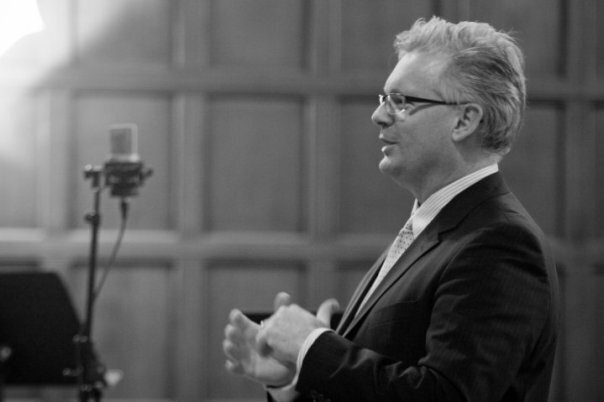 DAVID ARNOT-JOHNSTON has directed many vocal and instrumental groups, including at Canada's National Ballet School and Tafelmusik's Baroque Summer Institute at the University of Toronto. He completed the graduate program in early music at the Royal Conservatory of The Hague, The Netherlands, and holds a Masters degree in music history and performance from the University of Toronto. As a tenor soloist, David has performed with several early and contemporary ensembles, including Tafelmusik, the Studio de musique ancienne de Montréal, Opera Atelier, Dancemakers, Utrecht Barok Consort, La Capriola of Amsterdam, Utrecht Bach Society, Ottawa Choral Society, and The Toronto Consort. He has sung as a soloist under Sigiswald Kuijken, Andrew Parrott, William Christie, and with Emma Kirkby in works by Mozart, Handel, Bach, Lully, and Monteverdi. David has recorded as a soloist and ensemble performer on the Naxos, CBC, Marquis, RCA/BMG, and Analekta labels with the Aradia Ensemble, Tafelmusik Orchestra, Toronto Consort, Canadian Brass, and the Theatre of Early Music. A dedicated instructor of music, David directed the music education program at the National Ballet School for ten years. He has been conductor of the Hart House Singers since 2003. CONRAD GOLD, holds a Bachelor of Music from Oberlin College Conservatory of Music, and a Master of Music from McGill University. He undertook additional keyboard performance studies in Italy. Mr. Gold also serves as the accompanist for the Brampton Festival Singers, and has collaborated with the Tallis Choir and the Cantabile Chamber Singers of Toronto, and the Laudate Dominum Choir of Chatham. Currently living in Toronto, Mr. Gold plays organ regularly at Lorne Park Baptist Church in Mississauga, St. Michael's Cathedral in Toronto, and several other Toronto area churches. His other musical activities include playing organ recitals and teaching piano. 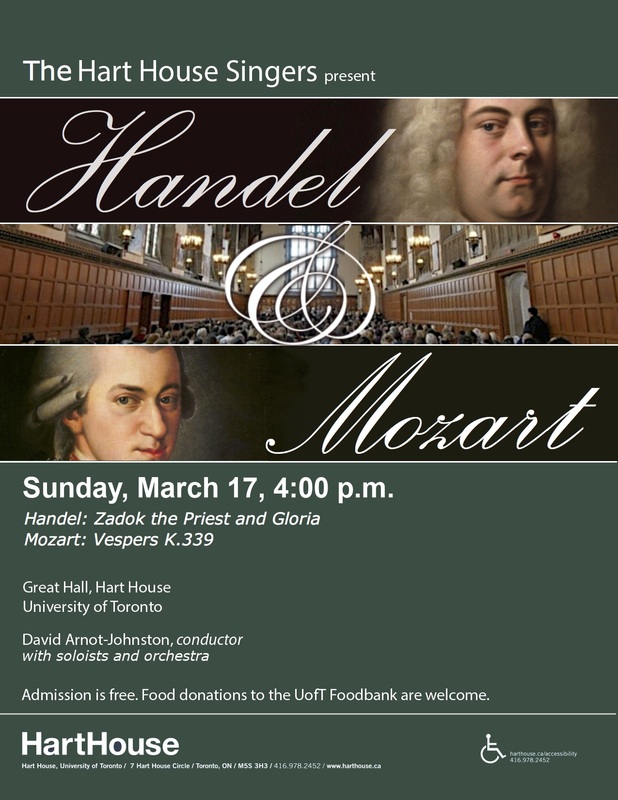 March 17th at 4pm in the Great Hall. Choral pieces with orchestral accompaniment. 3. Vespers (K. 339, Mozart). There will be a rehearsal 3:30pm to 5:30pm on Sunday, March 10th, in Hart House to make up for a rehearsal canceled due to inclement weather, check the hub (front desk) to confirm location. Come out and join us at one of two registration dates (see below). Registration is on a first come first served basis. Also, you must register again for each term, even if you were a member the previous term and have paid an annual fee (an annual $25 fee for students and full Hart House athletics members is good for three terms or there is a $15 a term fee, non-members can pay either a $225 annual fee or $120 fee per term, non-members seniors (over 65) pay $165 annual fee or $90 fee per term; note there is no longer a clubs membership). Have a friend register on your behalf, bringing your fees (if applicable) and identification. Note: One person can only register either him/herself OR one other individual in their absence, but CANNOT register both or multiple individuals. If you are unable to do either (1) or (2), contact us by email (see below for opening dates), provide us with your name and voice part, and we will put you on the appropriate waiting list. Note: If on the waiting list, you are encouraged to attend rehearsals weekly and share music off your neighbour. We will take people off the waiting list as space becomes available in the choir. The Hart House Singers' 2019 Winter session begins on Monday, January 7th, 7:45 to 9:45 p.m. Rehearsals are on each Monday evening, 7:45-9:45 p.m., from January 7th to March 11th, 2019. The winter concert will be on Sunday, March 17th, 4:00 p.m. Registration will be on January 7th and January 14th, starting at 6:30 p.m. at Hart House. The first two rehearsals (January 7th and January 14th) are also "open rehearsals" - you may attend either rehearsal and decide if you would like to join afterwards. *“Student” means any student who has paid ancillary fees s part of their academic program; "member” refers to those who also have a full Hart House fitness centre membership. Concert Thursday July 11, TBA Nov. 18, 5:00 p.m. REPERTOIRE See Repertoire page. See Repertoire page. See Repertoire page. *Cash, debit or credit card are all acceptable forms of payment. **To join the Singers, you must provide proof that you have paid the club fee for the term or covering year. Even if you were a member of the Singers last term, you are still required to register for this term! Registration will be granted on a first come, first served basis. Note: If you are a soprano or alto, come especially early! Spots in the choir for these voices tend to fill up quickly. There is no audition. Singers of all levels are welcome to join! Please drop off any outstanding music ASAP at the Hart House Hub (Main Desk) and email us so that we can process your return. The last day to pick up your music deposit is TBA, provided you have returned all your music. If you paid your deposit in cash then at the conclusion of the Summer term, whether or not you intend to rejoin the Singers for the Fall term (Sep 2017), you are required to pick up your deposit by August 31st, 2017. Drop by the Accounts Office (hours of operation: Monday-Friday, 9:00-5:00) on the second floor of Hart House to pick up your deposit, if you paid in cash. Deposits paid by credit card will be credited to your account.